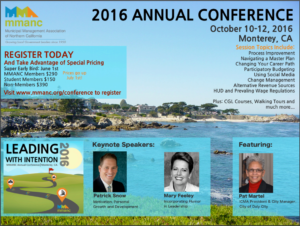 The Municipal Management Association of Northern California (MMANC) is proud to present the 66th Annual 2016 Annual Conference, to be held October 10-12, 2016 in Monterey, CA at the Marriott Monterey. The theme for this year’s event is Leading with Intention. The conference will feature the following sessions: Change Management, Navigating a Master Plan, Participatory Budgeting, CGL Courses, Speed Coaching and much, much more! We have a variety of sessions, whether you are looking for professional development or something more technical – the MMANC Annual Conference is for you. For more information, check out the event webpage (http://mmanc.org/annualconference) or see the flyer below. Kim Castro is the Recreation Manager for the City of Santa Clara. She previously served in the City of Mountain View as the Community Resources Manager in the City Manager's Office. Kim is an MMANC Region 1 Co-Chair.